87% of new players recommend this casino 39 new players chose this casino today! 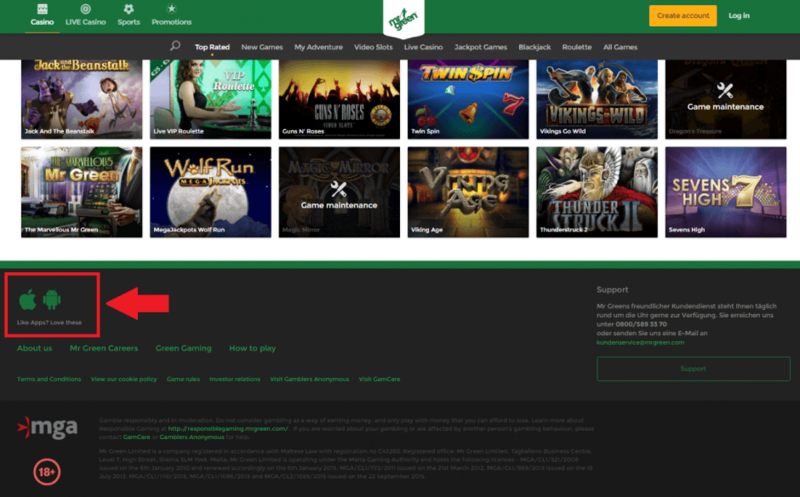 Mr. Green Casino Review: Is it the Best Gambling Site on the Web? Some say Mr Green is the best online Casino of 2018. Others swear there is a way to win at the room’s Slots every time you play. Is this true? Is this the gambling site that gives you the best bang for your bucks? The only way for you to find out is to read our Mr Green Casino review and play with the exclusive free spins bonus you can unlock only if you read your guide. Good luck! There’s never been a better time to play at Mr. Green Casino. You can read the next section of this review to know why I believe this site is is one of the best online casinos of 2018, or you can simply continue reading this part to discover the amazing welcome bonus you get once you move onto real-money play. There’s a 100% up to €100 bonus available on your initial deposit. As if that would not be enough to try the Casino, Mr Green also awards you with 100 free spins! You can use your free spins to play one of the most popular games available in the casino - Book of Dead. And you don’t even need to use promo code to get this bonus. If you deposit a minimum of €20 your account will be credited with deposit match bonus and 100 free spins. Over the next five days you will receive another 100 free spins: 20 spins a day! Note: When you open your account at Mr Green Casino from CasinoSmash, no bonus code is needed to be part of the exclusive promotions listed on this page. Also, the bonus comes with a 35x play-through and zero time restrictions. Awesome. Time to move onto the serious stuff: compatible software and the games Mr. Green has on tap. Or, as TechCrunch would put it, will Mr Green Casino fly or die? How Does Mr. Green Casino Work on Different Browsers? You don’t need more than an internet browser to play, and that’s great because this means you don’t need to throw your expensive Mac away if you are a friend of the fancy machines made in Cupertino. I tried their games on Windows 10, MacOS Sierra, and Linux (Ubuntu), and everything worked just as I expected it to. Also, I didn’t notice any differences when I played from Chrome, Firefox, and Safari. Mr. Green support says the casino works equally well on the newest version Internet Explorer featured on Windows 10 systems- but since I’m just not an IE kind of person there’s no way I can verify this. The site’s UI is excellent, too. You don’t need to know much about online gambling to find the games you want and - what’s even better - to access each game’s option. If you find frustrating to move your mouse around in the hope the cursor will change into shape and show you how to change the size of your bets or turn off the sound, stay assured this will not happen at Mr. Green Casino. Your fingers are likely to shake the first time you access the platform and discover how many games they offer. I’m not saying the choice is bad; it’s just…overwhelming. Mr. Green features hundreds of games from the world’s best developers. Access the site and you’ll find an almost endless amount of games the likes of Betsoft, Evolution Gaming, IGT, Wagerworks, Microgaming, NetEnt, and Push Gaming. Slots are the room’s clear focus, and that’s why your account gains you access to stunning titles like Guns N’Roses, When Pigs Fly, Game of Thrones, Gonzo’s Quest, Transformers and Tomb Rider, alongside a good number of exclusive titles you won’t find at any other casino site. In addition to the games mentioned before, you can also enjoy live casino options where professional dealers stream their services directly to your home. In fact, you can also access these features on the go, and we will explain how you can do that below. Mr Green Casino Mobile: Yes or No? You can bring this stylish and innovative casino room with you all the time thanks to their great mobile platform. Mr Green Casino works on iPhone, iPad, Android, and Blackberry devices giving you access to the site’s full offer from wherever you can find an internet connection. When you play from mobile, don’t forget to check the mobile-only promotions on tap. Every time you fire up the Mr Green Casino app on your smartphone or tablet you have the great opportunity to pad your bankroll with some good extra free money! Mr. Green Mobile App for Android? Mr. Green’s Mobile application is available on GooglePlay for Android users looking to get in on the fun. Unfortunately for Windows phone owners, you cannot join the action on mobile but perhaps it is time to reconsider some of your purchasing decisions when mobile shopping. Mr. Green Mobile App for iPhone? Naturally the app is available on iTunes for Apple lovers. To download the app for either Android or iPhone simply scroll down Mr. Green’s homepage and click on either the Android or Apple icons as shown below. You can’t call yourself a gambler if you don’t have an account at Mr. Green Casino - it’s as simple as that. The award-winning platform offers you plenty to enjoy your sessions: a great software, a lot of free money, and an insane amount of game to try. Progressive jackpots are huge, too. Thanks to games like Mega Fortune, Hall of Gods, and Arabian Nights, you are always a few click away from the possibility to win millions with a single spin. Overall, we agree with the opinions of our readers who consider Mr Green to be one of the best online casinos on the web and we advise you to give it a shot. After all, as long as they have a no deposit bonus on tap, you have nothing to lose! Mr Green’s customer support is extremely good. You can get all your questions answered via phone, emails, and live chat. When I tried this last option, I found that the site’s customer reps were very well prepared and polite. The sites features also a first-aid F.A.Q. section with answers to all the most common questions users pose to the customer support. If you don’t have too much time, head there before you open the live chat. Once your account is confirmed, you can use all the most common payment methods for your deposits and withdrawals. Methods accepted on the platform include all the major credit cards, bank wires, and popular e-wallets like Skrill and Neteller. There are many deposit options on Mr. Green Online Casino. You can choose the most convenient one for you.